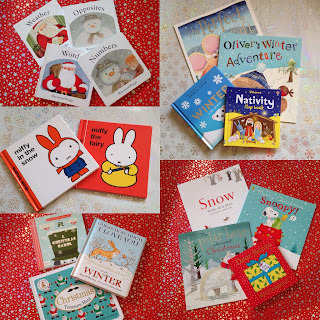 The countdown to Christmas is about to begin and this year the excitement of Christmas has been enlivend anew for me as it will be BookBairn's first Christmas! Suddenly, our old Christmas decorations and traditions seem dusty so I am inspired to bring back some sparkle to the festivities, starting new traditions and polishing up the dusty ones. One tradition I am excited to throw some glitter on and bring some cheer to is to upgrade our Christmas countdown, especially since BookBairn is really too small for a chocolate advent calendar (don't worry I'll eat hers!). I hope to start a new BookBairn-family tradition by creating a book advent tree to countdown the days until Christmas. To get started, I have been collecting Christmas and winter-themed books for a couple of months, and whilst it has been quite costly this year, I plan to put the books away at the end of the festive season and bring them back out again next year (and they will seem new again!) and over the years simply replace some books as BookBairn outgrows them. I should point out that not all the books are new and not all are festive (24 new books seemed far too indulgent, even for BookBairn). I have included a photo of the festive books I have included (if you are interested in doing something similar, I found the Book People website to be really good as it sells packs of books working out at around £1 a book or the Hive online bookstore which sells books cheaper than Amazon and contributes part of the sale to the highstreet/local bookshop of your choice). It has only taken two days worth of BookBairn's naptimes but I have finally lovingly wrapped all 24 books and piled them into a Christmas book-tree. The plan is to open a book each day and savour some special time cuddled up together and enjoy the gift of an advent story. I hope that in the future our advent tree will become a family Christmas tradition that BookBairn and I will look forward to! What a great idea. I'm also counting down to BookBairn's first Christmas. It's going to be fun. Great idea! Let's hope lots of people copy this! Thanks Catherine! It took ages to wrap them all up and still have the actual Christmas wrapping to do but can't wait to start unwrapping. Look forward to seeing your books unwrapped on your blog too! Thanks Tracey! I think I might have as much fun (more) than BookBairn will!